Since UM-Flint’s web transition project began, we in University Relations have been throwing around the term “card sorting” like it’s going out of style. We tell you that card sorting will help you organize your web content, will open your eyes to how your website should be structured, and will be fun. Who wouldn’t want to do a card sorting? So, what is card sorting anyway? Card sorting is a method used to help design or evaluate the information architecture of a site. 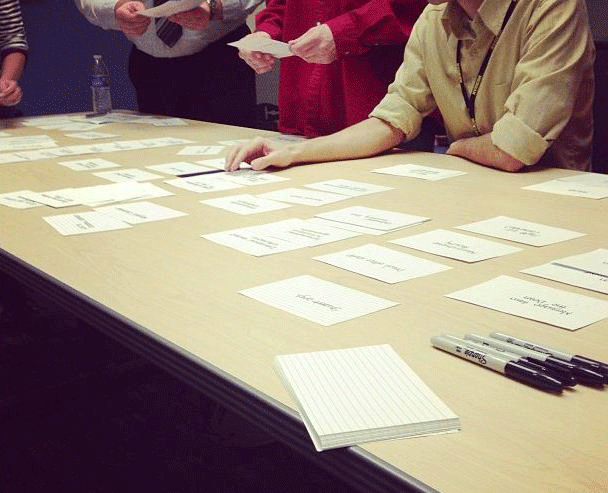 In a card sorting session, participants organize topics from your website into categories that make sense to them. Participants may also help you label these groups. Card sorting may involve physical cards or pieces of paper, or it may be accomplished with one of several online card-sorting software tools. Card sorting will help you understand your users’ expectations and understanding of your topics. Knowing how your users group information can help you: Build the structure for your website; Decide what to put on the homepage; Label categories and navigation. With that out of the way, let’s jump in! Before you can sort any cards, you’ll need to determine what pieces of content need to be sorted. Before any card sorting activity, you’ll need an inventory of your current website content. For more information about content inventories, we recommend “The Content Inventory is Your Friend” by everyone’s favorite content strategist, Kristina Halvorson. Essentially, a content inventory is a spreadsheet that captures all of the content you have out there on the web. Once you’ve inventoried it, you’ll know what you’re working with. Using your content inventory as a guide, you can create a card for each piece of your web content. A card might represent a page, a block of text, or any component you want to make a decision about. Next, get people in a room who can help make decisions about how the content (cards) should be organized and grouped. When people have to make a decision about each card, they find ways for content to be grouped together, and have conversations about what is needed and what is not. It’s fantastic. How can you guide visitors through your content and navigation? You’ll get the most out of your card sorting when you’re able to separate yourself from your current website and consider your content with a fresh perspective. Use the guiding questions above to help you organize what you have, but also consider what new content might be needed. And feel free to let go of content that doesn’t directly serve your audience or your goals. Have your content inventory and Google analytics available for reference, but try not to refer to them too much. The goal is to approach your content without feeling obliged to stick to current practices. We did look at our current site and I think that made it take a little longer than it should have, so I agree with your recommendation that if you’re not tied to your current site, to just go off the cuff. Card organization was very helpful to see our site and its organization in a tangible way, although we did end up adding more than we had before. This was a good opportunity to get lots of people that never look at our website to critique—although the sidebars and wordsmithing of current text got started a bit and I had to keep bringing people back to the big picture of simply organizing major blocks of content, pointing out that we’d have time to develop copy later. Now go forth and card sort! We’d love to hear all about your process and outcome. And if you have any questions, you know where to find us.